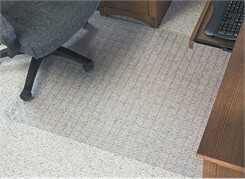 Premium mat features innovative, raised checkered grid for optimum carpet grip. Easy glide surface. LIFETIME GUARANTEE! Our chairmats are warranted to be free from defects in workmanship or material. Should the chairmat break or crack under normal usage and proper applications, the manufacturer will replace the chairmat upon proof of purchase. For users up to 250 lbs. Our Heavy Duty Vinyl Chair Mats are shipped rolled up in order to fit inside UPS size cartons. Place your chair mat in the sun or in a heated area to uncurl. You may need to place weight on top of the mat for the first few days. Your mat may take longer to flatten in colder weather, but your chair mat will eventually flatten completely with no sign of distortion. PRICE INCLUDES SHIPPING! Please allow 1-2 weeks for delivery. 1 - 5 $159.00 ea. 6 - 11 $154.00 ea. For low to medium pile commercial carpets with little to no padding. PRICE INCLUDES SHIPPING! 1 - 5 $189.00 ea. 6 - 11 $179.00 ea. High Pile Carpet .25" Thick Chair Mats w/Beveled Edges - 36"x 48"